Opened in July 2016,By The Bay Bed and Breakfast is a completely new facility, converted from a one hundred year old large family house, using the best quality materials and exercising every care in providing an exceptionally high standard of accommodation throughout. The proprietors live in the property adjoining and will be available 24/7 to ensure visitor’s needs are completely satisfied. By The Bay Bed and Breakfast is located in the centre of the picturesque fishing village of Cruden Bay and is very near shops and restaurants it is also adjacent to the world famous Cruden Bay Golf Course. Situated some 25 miles from Aberdeen, the oil capital of Europe, and only eight miles from Peterhead, Europe’s largest white fish port, both of these locations provide ample entertainment and shopping opportunities. Whether it is playing the world class golf course or any of the other fine courses in the vicinity, bird watching, walking or cycling through the many woodland and country paths or strolling along the clean sandy beach, there is something for most visitors to the Cruden Bay area to explore, experience and enjoy. Located in North East Aberdeenshire Cruden Bay is an ideal place to base yourself to explore the attractions of North East Scotland, The Malt Whisky trail is only a drive away where a wide choice of popular Speyside distilleries can be visited and product sampled and purchased. There are five Double / twin rooms all are complete with En suite toilet, TV, WIFI, Hospitality Tray, Fridge, hair drier, etc. 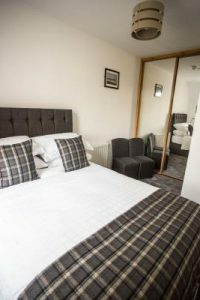 Our aim is to fully accommodate our guest’s needs and we look forward to giving you a warm Scottish welcome when you visit By the Bay Bed and Breakfast.